Which browsers and operating systems does SpatialKey support? Because SpatialKey runs in all modern web browsers, it is not tied to any particular operating system and can be used on almost any desktop or laptop computer with an Internet connection. Microsoft discontinued all support and updates for Internet Explorer 8, 9 and 10 on January 12, 2016. These old versions of IE will not receive any further security updates. If your organization is still running old versions of Internet Explorer please contact your IT department and upgrade immediately. If you are resetting a password for another user, you can follow the steps above or reset the password from within SpatialKey. 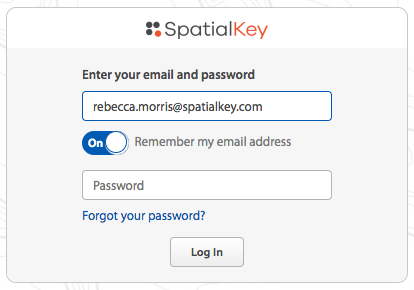 Find the user who needs their password reset in the People tab in SpatialKey. Enter the settings for that user and select Reset Password. The user will receive an email containing a link for resetting their password. They can click the link and enter a new password. How do I add new users to my SpatialKey account? Adding users is easy. You simply enter their information in the People tab of SpatialKey and they automatically receive an email with their account and login information. 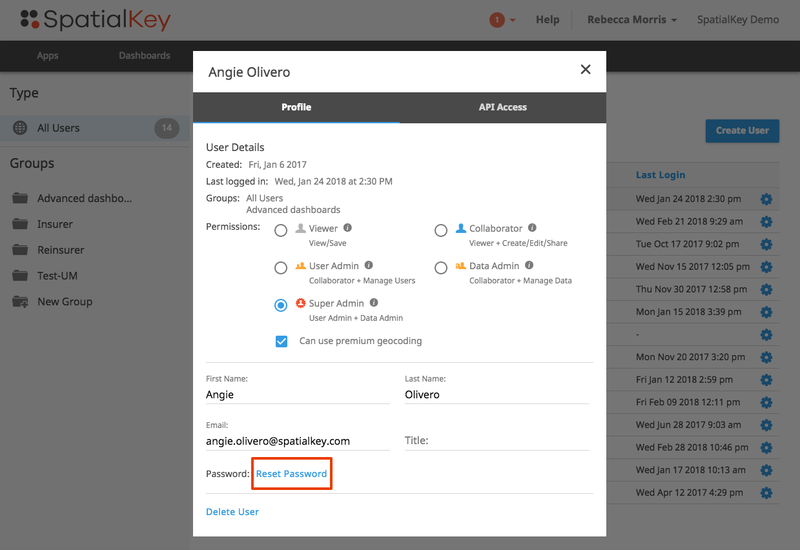 How do I remove a user from my SpatialKey account? Find the user who you wish to delete in the People tab of SpatialKey. Click on the gear for that user and select Delete User at the bottom of the page. How do I manage my end-user licenses? 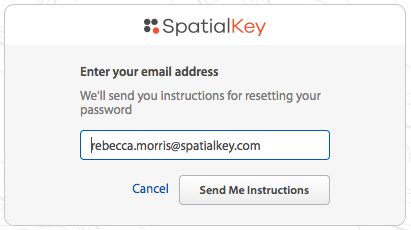 If you need to modify the number of users in your SpatialKey account, please contact us. I need to deploy SpatialKey within my organization. Do you provide deployment support? SpatialKey can be deployed to an organization in minutes with our On-Demand SaaS offering. Additionally we support an On-Premise installation that can be installed within your infrastructure. If you require assistance automating your data feeds from backend systems into SpatialKey we can help you get up and running quickly. Please contact us for more information. Does my subscription include upgrades and maintenance? Subscribers of SpatialKey On-Demand automatically receive system upgrades as part of their subscription. Organizations that have chosen to implement SpatialKey On-Premise will be charged an annual support and maintenance fee. What level of support does my subscription include? SpatialKey comes with free access to all web-based support materials and a 24-hour response time during the business week for all email or phone support requests. Custom support packages can be established on a fee basis for organizations requiring higher support levels. How much data can SpatialKey support? The base configuration for SpatialKey Enterprise is up to 30 datasets with up to 250K records and 50 columns per dataset. SpatialKey can support millions of rows per dataset, if you have requirements beyond the base configuration, please contact us. Your SpatialKey environment is automatically backed up on a daily basis. SpatialKey uses state-of-the-art security. SpatialKey On-Demand is a Software as a Service (SaaS) application built on top of the Amazon Web Services (AWS) platform. We use both the Amazon Elastic Computing Cloud (EC2) and Simple Storage Service (S3) as part of our infrastructure. An overview of the security processes taken for AWS can be found here. You can also find a more thorough white paper here covering AWS security topic. Additionally, all communication between the client and server is encrypted with HTTPS using SSL to prevent eavesdropping on data as it passes from the Amazon cloud to your client. If a hosted SaaS solution does not meet your needs, please contact us for information on SpatialKey On-Premise, where the application is installed within your infrastructure. Which release of SpatialKey is currently available? SpatialKey is offered principally as a SaaS application, with SpatialKey On-Demand. The software is continuously updated. Typically our development/deployment cycles are six weeks long. As such, we don’t take a formal approach to numbering our releases. If your organization opted for SpatialKey On-Premise, automatic updates are not possible so the release of SpatialKey that you have is subject to when the last upgrade of the environment was completed.